BlackTree offers a variety of revenue cycle services designed to improve the efficiency and performance of overall agency operations. Spend more time on focusing on daily operations while BlackTree’s experienced team helps you improve coding and OASIS accuracy, increase reimbursement and reduce write-offs. BlackTree’s team of clinical leaders has the expertise and real- life experience to help prepare your agency for the industry’s ever-changing landscape. "We were stuck just muddling along, and then we engaged BlackTree; now things are flying." 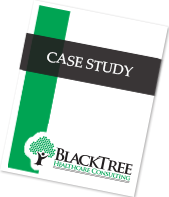 BlackTree Healthcare Consulting offers a full range of revenue cycle, outsourcing and clinical services tailored specifically to exceed our clients’ needs. Our engagements are custom-designed to improve your operational efficiency and positively impact the bottom line. Be a part of the fastest growing team in the industry. Speaking and conferences where you can meet us in person.